The concept of responsible investment, including green finance, ESG and impact investment, is increasingly recognized and accepted by Chinese financial institutions. 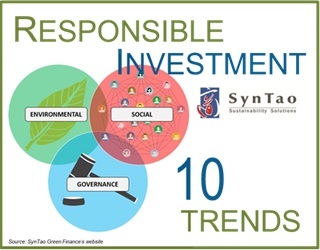 As an early advocate and pioneer of responsible investment in China, SynTao Green Finance（STGF）and China Social Investment Forum (China SIF) jointly released the “2019 Top Ten Responsible Investment Trends in China”, first published on 15 February 2019 – read the original publication here. In accordance with the general deployment of the Guidelines for Establishing a Green Financial System, China will make it mandatory for listed companies to disclose environmental information by 2020. In September 2018, the China Securities Regulatory Commissions (CSRC) established an environmental, social and corporate governance (ESG) information disclosure framework for listed companies in the revised Corporate Governance Code for Listed Companies. In October of that year, the Shanghai Stock Exchange (SSE) supported World Federation of Exchanges (WFE) in developing the Principles for Sustainable Exchanges, and recommended exchanges to issue ESG disclosure guidance. SynTao anticipates that ESG reporting guidelines for the A-share market may be released in 2019. As a result, it is possible that listed companies would upgrade their corporate social responsibility (CSR) reports into ESG reports with significant improvements in material and quantitative content. The UK-China Climate and Environmental Information Disclosure Pilot participated by ten financial institutions from China and the UK in 2018 will enter the second stage in 2019, with more results to be unveiled, which will encourage more financial institutions especially commercial banks to keep a watchful eye on the accounting and disclosure of environmental information related to their asset portfolios, and will also force listed companies to disclose more environmental information. In November 2018, the Asset Management Association of China (AMAC) released the Guidelines for Green Investment (Trial Version), which states that “ESG is an emerging investment strategy in the asset management industry and an important initiative for the investment fund industry to implement the green development concept and establish a green financial system”. Foreseeably, the AMAC will make great efforts to facilitate the implementation of the Guidelines. Meanwhile, the UN supported Principles for Responsible Investment (PRI) has recruited several Chinese mutual funds as its new signatories in 2018. Joining the PRI will motivate mutual funds to develop ESG investment products. Therefore, SynTao anticipates that more Chinese funds will adopt ESG investment strategies in 2019, and the more aggressive ones will introduce ESG-themed mutual fund products. Companies like China Securities Index Co., Ltd. (CSI) and MSCI are expected to launch more ESG-themed indices. The emergence of ESG-themed mutual fund products will transform the structure of participants in responsible investment and green financial markets in China, making individual investors have more channels to directly participate in responsible investment and green finance. Moreover, the public sale of mutual fund products will also promote the education and dissemination of responsible investment knowledge among individual investors and the general public. The fact that responsible investment puts premium on long-term value coincides with the investment approach of long-term assets such as insurance and pension funds. SynTao anticipates that, driven by the regulator’s policy encouraging long-term insurance funds to increase the proportion of high-quality listed companies in their portfolios, insurance funds will lead the efforts to explore ESG by paying more attention to their ESG strategies in 2019 to avoid risks and secure mid-and long-term stable return. China Life Asset Management Company Limited took the lead in joining the PRI at the end of 2018, which will cause more insurance asset management institutions to recognise and endorse PRI in 2019. Meanwhile, insurance companies behind insurance asset management arms will also attach greater importance to ESG and green insurance products. Another important force of long-term asset is the National Social Security Fund (NSSF). Its Vice Chairman said at the end of 2018 that NSSF would have a closer look at and study ESG. Thus, SynTao anticipates that when NSSF will entrust others to make investments in 2019, it will also include ESG into its consideration, which will stimulate mutual funds to value ESG. The Ministry of Civil Affairs promulgated the Interim Measures for the Administration of Investment Activities of Charitable Organisations for Value Preservation and Appreciation in 2018, which permits charitable organisations to entrust their assets to professional asset management firms for investment purpose if such investment may not violate their tenets or damage their reputation. SynTao anticipates that charitable organisations will take steps to introduce the responsible investment concept and join other long-term assets in supporting ESG development. From the fake goods scandal of e-commerce newcomer Pinduoduo to the passenger safety incidents of ride-sharing firm Didi Chuxing, the CSR problems of Chinese unicorn companies have often been called into question despite their surging value in the capital market. For risk considerations, many PE and VC investment funds have started to systematically investigate the ESG factor of their investments. Not long ago, the AMAC stated for the first time, in the Guidelines for Green Investment (Trial Version), that private equity funds may reference the green investment concept set forth therein. The G20 Sustainable Finance Study Group also identified the development of sustainable PE/VC as a key research subject. Currently, domestic PE/VC companies, including CITIC Private Equity Funds Management, Hony Capital and Sequoia Capital China, have already made ESG investment attempts. In 2019, downbeat market expectations will generally hold sway. Under greater downward pressures, investment strategies in line with ESG principles will enhance the robustness of target companies or projects, and reduce risks posed to PE and VC investors. Therefore, SynTao recommends PE and VC funds to incorporate ESG into the whole process of project screening, due diligence, investment decision-making, post-investment management and even exit strategy. SynTao also recommends investee companies and projects to manage and disclose their own ESG performance. In 2018, China’s green bond market witnessed continued and stable growth, with the issuance of more than 120 labelled green bonds worth around RMB220bn. However, green bonds remain a small share of China’s bond market. How to motivate issuers and investors and scale up the market remains a key challenge for China’s green bond market in 2019. In terms of product segments, SynTao anticipates that an increasing number of green asset-backed securities and infrastructure green bonds will be issued in 2019. It should be noted that the Green Bond Standard Committee was established in December 2018 under the guidance of the People’s Bank of China (PBoC), the CSRC and other regulators, and has the National Association of Financial Market Institutional Investors (NAFMII) as the Chair. This Committee is China’s first self-regulatory and coordination mechanism for green bonds, and is expected to play an important role in 2019, especially in the harmonisation of green bond standards and market access of green bond verifiers. Syntao anticipates that the second edition of the Green Bond Endorsed Project Catalogue, which has been discussed for a long time, will be released within this year. Requirements for qualifications, technical standards and self-regulation of verifiers as set out in the Guidelines for the Assessment and Certification of Green Bonds (Interim) will also be gradually implemented in 2019. Therefore, China’s green bond market will be further regulated. At the end of 2018, the English and Chinese versions of consultation draft of the Principles for Responsible Banking were officially released at the UNEP Finance Initiative (UNEP FI) Global Roundtable and the Sixth China SIF annual conference. This Principles provides banks with a consistent framework which incorporates sustainable development elements at the strategic, investment portfolio and transaction levels and in all business areas. It will be officially unveiled and endorsed by the first group of banks worldwide in September 2019. As a core working group member, Commercial and Industrial Bank of China (ICBC) is likely to be one of first banks to endorse the Principles. SynTao anticipates that the Principles will be supported by Chinese regulators and industry associations, and endorsed by more Chinese banks in 2019. Commercial banks remain a key force of green finance in China especially through its green credit business. In 2019, this trend will continue. The balance of green credit in China exceeded RMB9trn in 2018, and is expected to surpass RMB10trn in 2019. Furthermore, policy discussions on whether the risk weight of green assets can be or should be reduced deserve the close attention of commercial banks. Any breakthrough in this regard will be a strong incentive for green credit business. More and more local governments will adopt green finance policies. According to SynTao Green Finance’s China Green Finance Policy Database, all provincial administrative regions had released green finance policies by the end of 2018, which cover green bonds, green credit, green equities, green insurance, green development funds, environmental finance, and other areas. In 2018, the number of policies implemented in provincial, prefectural and municipal administrative regions increased by 68.6% year-on-year, and the number of policies which have clear quantitative criteria for financial incentives slightly increased, accounting for 13.3% of all policies. 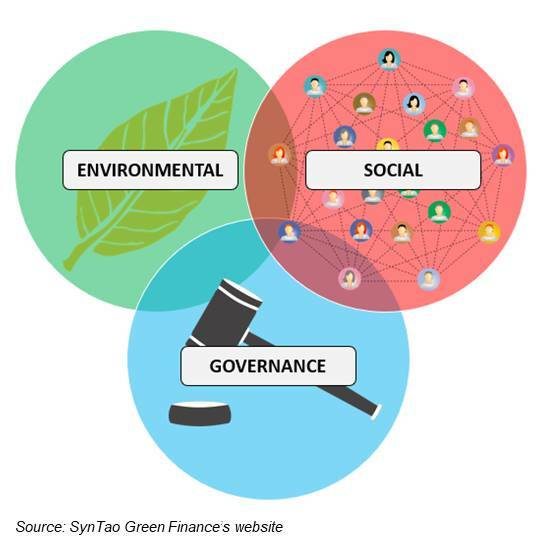 In 2019, Syntao anticipates that local governments at all levels will continue to issue more policies to support the development of green finance. Among them, policy signals and facilitation measures are the most common, and substantive financial incentives will slightly increase but remain limited. Meanwhile, some local governments will tend to regulate standards and quantify assessments during the implementation of their policies, which will deepen green finance policy development. This trend will become more evident for the green finance pilot zones in five provinces. For instance, a few local areas have initially established a system of green finance standards, including standards for green companies and green projects, etc. Since the launch of the Belt and Road Initiative, Belt and Road investments have increased substantially. Meanwhile, the international community has been closely following the environmental and social impacts of the Belt and Road investments. Over recent years, greening Belt and Road investments has become a hot topic globally. In November 2018, the Green Finance Committee (GFC) of the China Society for Finance and Banking and the City of London jointly released the Green Investment Principles for the Belt & Road, which advocates the incorporation of sustainability principles in asset classes, financial products, project implementation, management of participating agencies, and other processes. The Principles has been endorsed by many large financial institutions and enterprises. SynTao anticipates that the Principles will play an important role in greening Belt and Road investments. Chinese and international financial institutions should closely follow and support these Principles, and attach great importance to the assessment and management of environmental risks of Belt and Road investments. In addition, China will continuously enhance international cooperation on green finance. China has carried out bilateral and multilateral cooperation and pilot programs with the UK, France, Germany, Luxembourg and other countries in such fields as financial regulation, green bonds and information disclosure, with great results having been achieved. This trend of cooperation will continue in 2019 and financial institutions with market influence are expected to be active participants in such cooperation. Since 2018, China has introduced a nationwide environmental damage compensation system on a pilot basis, laying the groundwork for environmental public interest litigations that used to be difficult during the early stage of the implementation of the new Environmental Protection Law. From January to November 2018, environmental and resource protection cases accounted for more than half of about 90,000 public interest litigations initiated by prosecutorial authorities all over China. SynTao anticipates that in 2019, more environmental public interest litigations will enter judicial proceedings, and the retrospective effect and joint and several liabilities of such litigations will be extended to financial institutions, especially commercial banks, which have business cooperation with polluting enterprises. In 2018, the Green Garden Environmental Friendliness Center brought a lawsuit against Xiangda Agricultural & Animal Husbandry Co., Ltd. for polluting Hanjiang River, and applied for having two commercial banks that provided loans to the defendant named as co-defendants. This case deserves attention from banks’ business and legal departments. 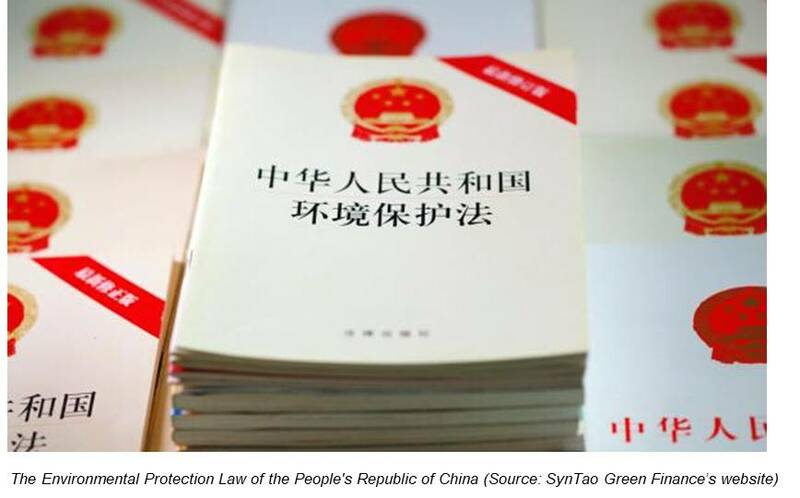 In January 2019, the Supreme People’s Procuratorate and other nine national agencies issued the Opinions on Enhancing Cooperation and Coordination in the Prosecution of Public-Interest Litigations to Legally Fight against Pollution, which is expected to address many challenges in litigation practices. With the improvement of these legal systems, various financial institutions, including commercial banks, will be confronted with a greater risk of environmental public interest litigation and greater financial risks resulting therefrom. It is necessary for their legal departments to get prepared for such risks. In July 2018, the G20 Sustainable Finance Study Group discussed fintech’s great potential in promoting sustainable financial development in its 2018 Sustainable Finance Synthesis Report, including the potential to provide more abundant, accurate and effective data through cheaper and faster means, reduce search cost, improve the pricing of ESG risk and opportunity cost, optimise the measurement, recording and verification of sustainability indicators, and offer sustainable financing in a more creative and inclusive way, among others. With strong growth of internet companies, China has advantages in fintech in terms of size and technology. Great potential can be unleashed from exploring green finance innovation. In 2019, SynTao anticipates that under the trend of tightened financial regulation, fintech companies will increasingly return to their original role by putting technology at the service of finance, and make more efforts to find ways to cooperate with traditional financial institutions by taking advantage of their access-to-consumers and technology strengths. In exploring green finance, therefore, fintech companies will start with these strengths. In addition, fintech companies have a natural advantage in inclusive finance, a key element of responsible investment, which deserves further efforts, especially in how to combine it with poverty reduction in China. SynTao Co., Ltd. is a leading Beijing-based consultancy promoting sustainability and responsibility in the Asian region. We provide consulting, research and training services in Corporate Social Responsibility (CSR) and Socially Responsible Investment (SRI). SynTao has developed successful partnerships with a wide range of local and overseas organizations such as international and national corporations, government agencies, NGOs, academic institutions and media groups. SynTao has been working on corporate sustainability disclosure and reporting for a long time. Each year, SynTao publishes a research report A Journey to Discover Values to provide up-to-date analysis on CSR reporting in China. SynTao also develops the MQI Guidelines and MQI database. MQI Guidelines provide a set of materials and quantitative indicators by sector so that companies can improve CSR report quality. MQI database, www.MQI.org.cn, has included over 10,000 CSR reports released by companies in China. SynTao is headquartered in Beijing with offices in Shanghai, Guangzhou, Chengdu and Washington DC.